Check off this a.m. to-do list and you’ll have more energy and get more done all day long. Some mornings everything goes right. You wake up before your alarm goes off. Your morning jog feels like playtime. The coffee tastes better. And there is no traffic on your way into the office. And when you sit down to get to work, you feel like you could conquer the world. Other days are not like that all. And while you can’t prevent every unfortunate a.m. situation that might come your way, experts say there are a few things you can do to encourage your mornings in that direction so you can make the most out of the rest of your day, too. “If you wake up [energized], you’re going to carry that energy through the rest of the day,” says productivity expert and coach Ellen Goodwin. Starting your morning with little “wins” (having an outfit picked out and ready to go, working out and leaving on time) primes your brain to work toward more “wins” and successes throughout the day, Goodwin explains. “Energy equals willpower — and you only have so much at a given time,” she says. So the more of it you use to recover from a train delay or an alarm-didn’t-go-off morning, the less you have later for concentrating on a big project at work, family drama or whatever your day throws your way. There are also physiological reasons you’re doing your body (and the rest of your day) a favor when your morning right. The body’s natural body clock — your circadian rhythm — runs on a roughly 24-hour cycle with the help of cues from your environment (like lightness and darkness and exercise) to help regulate sleep, energy levels, metabolism and other bodily functions. And the choices you make to start your day, from logging that early-bird workout to sleeping in for too long, either help or hurt keep that clock running on time, Namni Goel, PhD, a research associate professor in psychiatry in University of Pennsylvania’s School of Medicine says. “The morning is a critical time that can set the tone for the entire day” — and your short- and long-term health, says Goel — a biological psychologist and behavioral neuroscientist who specializes in sleep, circadian rhythms and their effect on human physiology. Here’s what Goodwin and Goel say are some of the best things you can do to start your day right. One of the most productive things you can do to start your day on the right foot should actually happen before you go to sleep the previous day, Goodwin says — make a plan. It doesn’t need to be a minute-by-minute itinerary, but it should map out the major tasks or things you want to accomplish the next day — and how you want to spend the first few hours of the day. Giving yourself a few extra minutes of slumber may seem like listening to your body, but in the long run you’re probably doing more harm than good. That’s because those 10 extra minutes of shuteye tend to be low-quality, light sleep since it’s not long enough for your body to make it through another sleep cycle (which tends to take around 90 minutes). Having trouble tuning worries out and turning your brain off? Try journaling or coloring. Both activities have the same effect as meditation. And turning in at night and waking up in the morning at the same time everyday is one of the big ways you help keep your circadian rhythm running smoothly, Goel explains. Since our circadian rhythms play such a big role in regulating energy levels and metabolism, keeping your sleep schedule regulated is one of the most key things you can do to feel energized and ready to wake up morning after morning, she says. Add lemon, ice or cucumber — or just drink it straight up. We get dehydrated overnight (especially if nature calls and you’re using the bathroom in the pre-dawn hours), Goel says. A glass or two of H2O first thing helps replenish your body’s hydration stores. It also starts your metabolism on the right foot (since the body relies on water to keep all your digestive processes running smoothly). “Quieting the brain is a time-honored way to be more creative, more contemplative and more in touch with oneself,” Goodwin says. Some people might not necessarily feel an energy boost from meditating, but because it helps us to think more effectively and efficiently, it should make for a much more productive day. Having trouble tuning worries out and turning your brain off? Try journaling or coloring, Goodwin suggests. Both activities have the same effect as meditation, she says — to calm you down, slow down and focus your thinking and let inspire you to think more creatively. Muster the energy to start sweating first thing and it will reward you. Exercise releases endorphins — chemicals produced in the brain that help minimize pain and discomfort and increase wellbeing (essentially the body’s own painkillers). Read: that early jog or spin class is giving your brain a natural high and an energy boost. Plus, endorphins can reduce stress hormones, too — helping you start your day unfettered and in control. Want to make that early workout work even harder for you? Do it outside in the sun. Getting sunlight first thing in the morning tells your body clock it’s time to start the day, Goel explains. Studies show that using specifically timed bright light therapy (with an artificial bright light) can yield some of the same benefits for your body clock as the sun does, if getting natural light is not an option — particularly for people with mood disorders, circadian rhythm disorders or jet lag. Though it’s worth noting that not all artificial light has the same effect, so ask a doctor to find a safe and effective treatment before you try it. 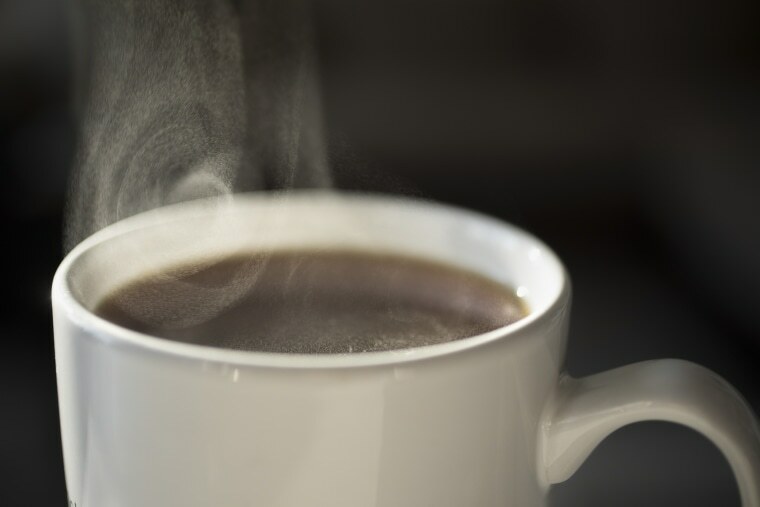 If a cup of java — or tea — starts your morning on the right foot, have your caffeine in the morning, Goel says. There’s a lot of data to show it really does help most people feel more alert and less groggy, she says. And while a coffee habit can get a bad rap, there’s also a lot of research that shows drinking it (in moderation!) actually has some health benefits, too. Plus if you brew it at home you’re saving yourself some green, too. Spending even just a couple of dollars five days a week on coffee can set you back more than $500 over the course of a year (or as much as $1,300 for a daily five-dollar latte). And even though there’s some discrepancy in the data, most experts agree skipping your first meal can make you more likely to overeat later in the day, Goel adds. She suggests eating within about two hours of waking up. “You want to be able to capitalize on those energy stores before you head out the door.” And include some protein, as well healthy carbohydrates (like fruit or whole grains) in you’re a.m.-meal, she adds — and skip the donuts and other sugar-packed foods. “A donut is not going to sustain you as well as eggs,” she says.